I’m in the process of slogging through Frank Herbert’s Dune. Slogging’s not really the right word. With other things going on at the moment, I’m a little more distracted, and Dune (the early sections, so far) requires quite a bit of engagement to get into. Part of my frustration stems from the medium in which I’ve been attempting to read. When I was shopping around for the books over the summer, I was frugal. I checked prices on several sites (for new copies… no I didn’t go the discount route) and the local library. The library’s offering was limited (1 copy, I think, in their entire system…). Unable to guarantee it would be available when I would need it, I opted to purchase. In my browsing, I found a better pricing on an ebook copy. All fine and good. Then I started reading. I’ve encountered simple issues in other books: commas transposed into apostrophes, lack of separating spaces after some punctuation marks…annoyances, but they don’t affect the gist of the text. The copy of Dune, however… there were sections where what should be a phrase is displayed as a handful of unintelligible characters. Not quite like an OCR string, but not far from it, either. Other times, there wouldn’t even be the funky characters, the phrase would just be missing from the middle of a sentence, but without any hint (beyond the contextual “Hungh?”) that something should be there. I gave up on the ebook version when I hit a page where a sentence was cut after about five words, and the rest of the screen was whitespace. The next screen? The start of a new sequence, not just a hiccupped page break. I might have continued, if that had been the case. In my frustration, I sought out the local B&N, because the timing wasn’t ideal for waiting for an Amazon delivery. Of the three options available (mass-market, publisher’s hardcover, or a “special” B&N edition), I went for the B&N one. The motivating thought? “If it’s something that’s going to be on the shelf, let’s make it something worth having on the shelf”…and it was the cheaper of the two hardbacks. One thing I’ve noticed between the two versions (bound vs electronic) is the paginated structure. The core material of the novel is broken into three specific parts. Each part is composed of numerous segments. I would consider them chapters, but they are not labeled as such. Specific delineations become obvious based on the use of whitespace on the printed page, but because of how the electronic version is parsed, those demarkations are more muddled. The upside? Even with the issues, while I am still far from finishing the book, I think I have read enough to generate a few hundred words about the structural elements and POV. As mentioned before, one aspect of how the Seton Hill MFA program is structured is the “Readings in Genre” courses. Students in the program complete a minimum of three (the courses themselves are offered in cycle, the focus repeating every third semester). Entering my third semester, and presumably final Readings course, here’s what’s on tap for the term ahead. ALIEN – Ridley Scott, Dir. The Thing – John Carpenter, Dir. *Members of the class voted during the summer. In addition to the above, the “common novel” for the next Residency will be Joe Hill’s NOS4ATU. Everyone in the program also has an assigned “Craft” book for the semester… mine is James Scott Bell’s Revision and Self-Editing for Publication, 2nd ed. Book Stack 6-20-2011, a photo by Theril on Flickr. And since I’m sure I won’t be finishing the entire stack before the end of 2011, guess what I’ll be pulling from in 2012? 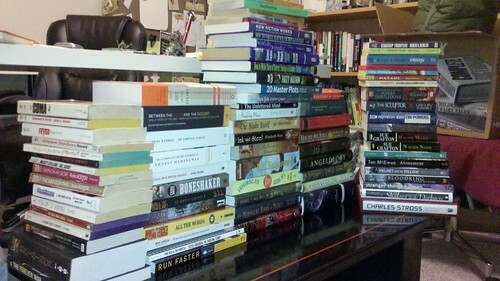 Yeap… and that stack doesn’t even include electronic titles that I will be working on. I mentioned before that I’ve changed my approach for this year’s reading list. I’ve gotten the “existing” (published before 2011) stack selected (which includes some ebooks), and here’s a few of the highlights, ones that I’m really looking forward to getting to (in no particular order). After an awesome Christmas gift from my wife, I’ve got an increased incentive to get into the series. I was at his Cary, NC stop of his For the Win book tour last year. My friend Chris suggested I start with Brother, and I’m always interested in a short story collection (Clocked). The current queen of Steampunk, which is a genre I’ve recently started exploring and attempted writing in. Time to finish the last book in the series (Queens), and get caught up on the events in the Laundry (Memorandum). I’ve been sitting on my copy (signed at Readercon last year), waiting for a chance to get done with all of the academic stuff to crack into it. Considered to be one of the masters, especially for tightening up (and thinning down) texts. I’ve been told she is one of the writer’s to read for character details, among other things. And it’s a short story collection. Enough said. Other books that I’ve got on my radar, but not including cover shots for (for sake of screen space and a lack of something pithy to add): Joe Haldeman’s The Forever War; Stross’ Glasshouse, Faith Hunter’s Bloodring, Elaine Cunningham’s Shadows in the Darkness, Seamus Cooper’s Mall of Cthulu, Lovecraft’s collected fiction (B&N Edition), Christopher Paolini’s Brisingr, Robin Cook’s Fever and Coma and Heinlein’s Friday. Only a glimpse at what’s on the reading stack, all waiting their turn to be devoured and have their styles observed and lives lived. Go, books. Okay, everyone, it’s time to grab your well-traveled towels, your bathrobes, and your handy-dandy Hitchhiker’s Guide (in a new, handy, iPhone sized package, most likely)… And Another Thing is out, and as the website indicates, it’s the sixth book in the trilogy (yes, you read that correctly, hence the joke with the web address). I am mentioning this with a couple of points in mind. First, I loved the originals, when I first encountered them some 20 years ago now, and flew through the first four books in a series of trips to the local library. I don’t remember reading the 5th one, that came out about the time I was getting out of high school. I haven’t read them again in years, so I’m interested to see how this one carries on the story. But at least I have a new excuse to think about going back to the local library, after I catch-up and reread the first books in the series. As I was doing some updates to the reading list (“Currently Reading”), I was reminded of something that I didn’t quite register until ia actually typed the numbers… I’ve read twenty books so far this year. Twenty! and I’m within about eighty pages of finishing number twenty-one! The goal of twenty-six is within reach, and will likely be broken long before the end of the year… and at this rate, it will be shattered by the time 31 December rolls around. Or “How to Avoid Writing”…. Not quite. I managed to fit two boxes worth on the shelf and a half that I had planned on using before running out of space. I gave up on trying to organize them outside of anything more than “really big series stay together”, or notable authors being set aside. Many of the collection could easily fall into the “pulp” category, the kind the Beatles’ referenced in “Paperback Writer”.